As the end of the year draws near, it's time to explore our very last Birth Flower in our series, the colourful Poinsettia. It's a multi-tasker, as it's also used as a traditional Christmas flower in the Northern Hemisphere. 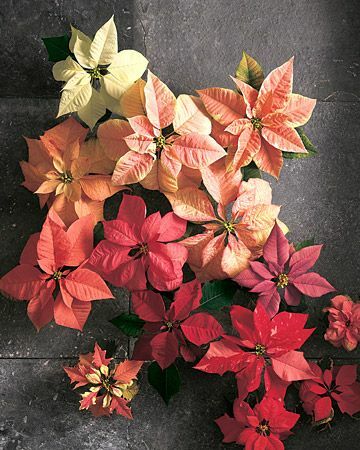 Poinsettias, or "Christmas Stars" originate from Mexico & Central America. With their rich red colouring, they were prized by Aztecs as a burst of colour in the cooler months, and were used as a red dye. Their name is derived from the man who brought them from Mexico to North America, one Dr Poinsett, who apart from having a love of colourful plants, was also a physician, politician and US ambassador to Mexico. It's believed that during his time there, in the 1820s, he came across the red flowering plant & sent cuttings of it back home to fellow botanists. It became known as the Poinsettia, and was eagerly embraced as a Christmas flower because it is one of the few plants that naturally flower in winter. The twist is that the part we see as the "red flower" isn't a flower at all - it's the bracts of the plant - which no doubt made it even more interesting to our Dr Poinsett. The bracts are colourful leaves, intended to act as a visual amplifier to flying insects, to direct them to the actual flowers, which are tiny little dainties of yellow or green in the centre of the whirl of coloured bracts. In this Watercolour by Marsha Woods, the colourful bracts range from reds through oranges to palest pinks. Modern breeding has allowed a variety of colours in the bracts, including striking cream and pale green tones. 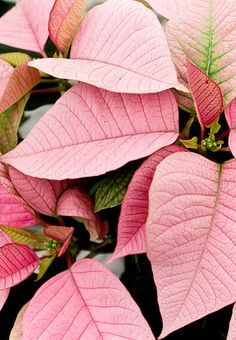 Now available in a stunning array of ombre tones of reds, pinks and whites, it's not hard to see why the plants catch an artist's eye, or for that matter, why they make a wonderful centre piece during the holiday season in cold climates when the Poinsettia is naturally in flower. In the traditional Language of Flowers, a gift of Poinsettias would convey respect, faithfulness & good cheer. As a Birth Flower, it represents the traits that December born people supposedly display: generosity, humour, cheerfulness. 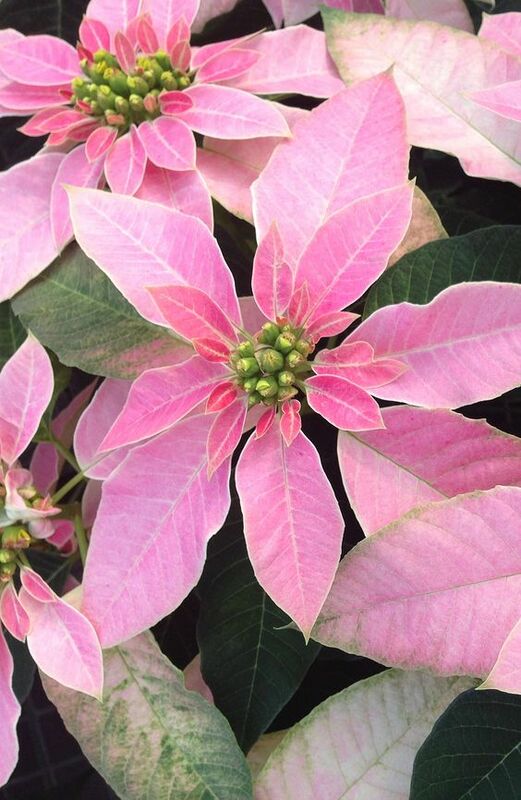 of Poinsettias look like flowers, but are actually leaves surrounding the real, quite tiny, flowers. 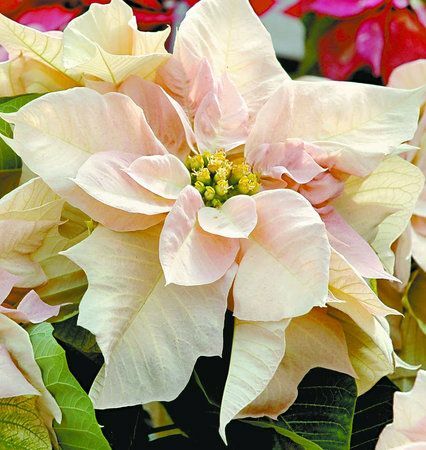 Select a plant which already has open colourful bracts, if you want it to "flower" over Christmas, as Poinsettias are slow bloomers. Do not overwater. They like a free draining soil, so let the soil almost dry out before watering, then make sure you don't let the pot sit ina pool of water. They don't mind the occasional mist of water on the leaves though, because they like humidity. Remembering they originally come from Mexico, they don't like to get cold! So keep them in a draft free spot, and warmly inside if you live in a cold climate. In Australia, they are happy in undercover spots like on a verandah or garden room, or will also grow happily outside, planted in the ground, as long as it is a frost free spot. Poinsettias adore morning sun, but not the hot afternoon sun. They love bright, indirect light. So place them near (not in) a window to catch lots of light. That's a south facing window if you live in the northern hemisphere, or north facing window if you live in the southern hemisphere. Once thought to be highly poisonous, they are indeed not so. The sap does contain latex, which can cause irritation to people with latex intolerance, but to the majority of people, this is not an issue. However, they are not edible, as they are very, very mildly toxic. Their botanical name is Euphorbia pulcherrima. 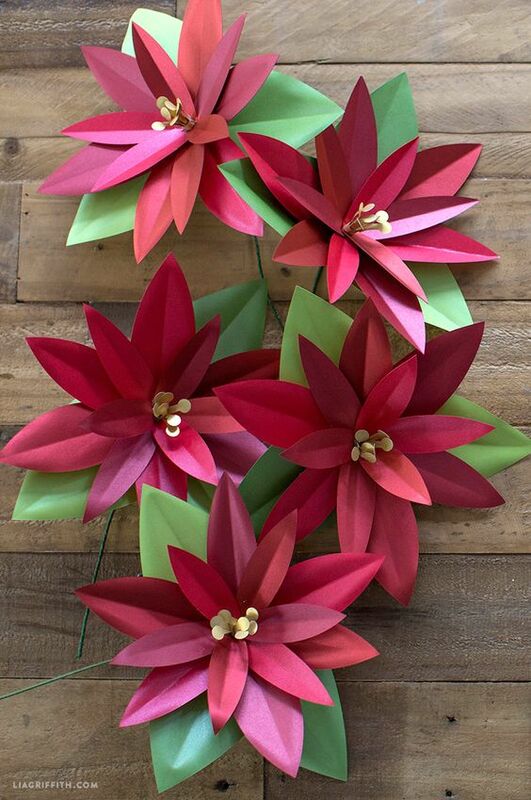 If it's hard to find botanical ones, try making your own Poinsettia flowers to decorate the Christmas table. IMAGES: sources for all images are on our Pinterest board "Birth Flowers" here. Interested in the other Birth Flowers for all the other months?